Tomorrow is a day that is dreaded by some and loved by many. The retail industry rakes in a boatload of money from candy, stuffed animals, and jewelry each year for V-day. 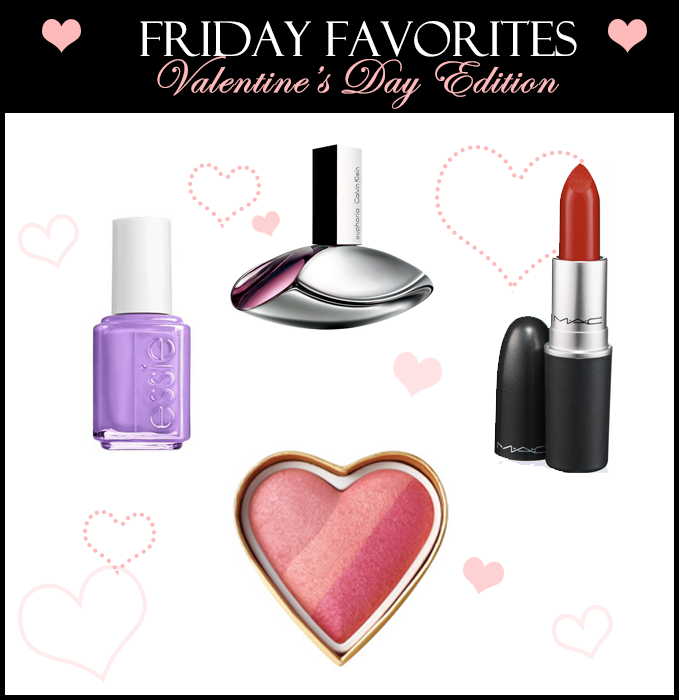 Although it is over commercialized, I love Valentine’s Day. 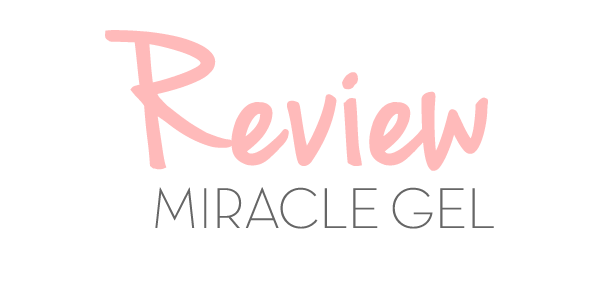 Not because I’m all squishy loving love, but I adore the combination of red and pink together. Everything from pizza to donuts can be bought in a heart shape. Can food get any cuter? Essie Nail Polish in Play Date My new favorite Essie polish! 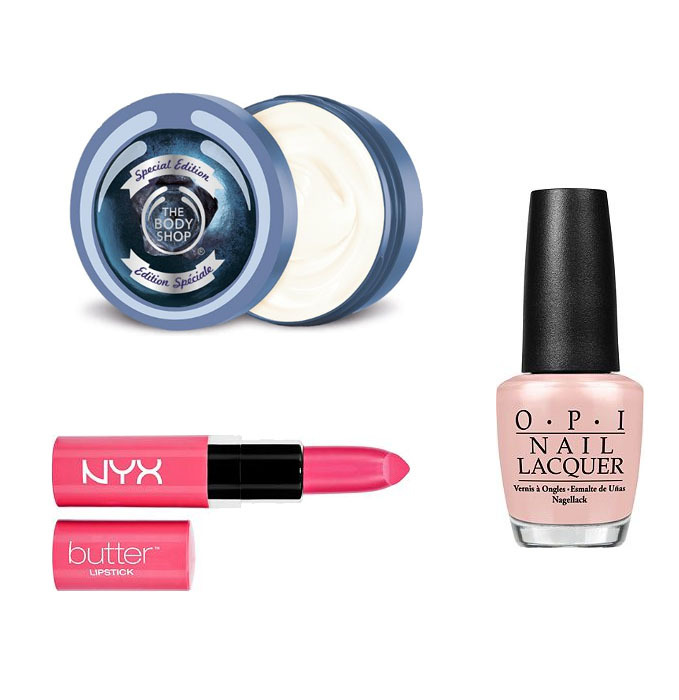 Once applied this color is just as vibrant as it appears in the bottle. This pastel-ish purple is such a pretty color for the slowly approaching spring. Too Faced Sweethearts Blush in Very Berry This blush is bright and really pigmented. A little bit goes a long way for those of you who have paler complexions. 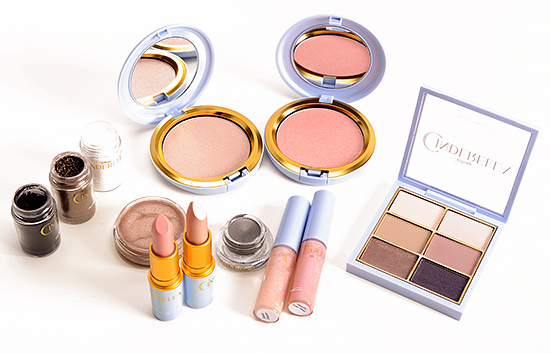 Candy Glow and Peach Beach are two other color options. The Candy Glow color is probably better suited for pale skin tones while Peach Beach appears to have more of a shimmery bronze tone. This blush is pricey, but Too Faced products have not disappointed me yet! The packaging itself is adorable. MAC Cosmetics Lipstick in Russian Red This is the classic movie star red lipstick. 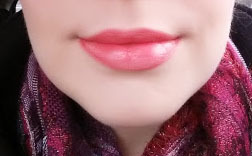 Generally I am not a lipstick person, but I was going for a pin up look when I got married and picked up this color after it was highly recommended to me. I paired it with some cheap Rimmel lip liner and it looked amazing. Calvin Klein Euphoria Perfume My all time favorite perfume, Euphoria is a light floral musk fragrance. The smell lasts all day, but is not overpowering. Next time you are out stop and try a sample of this! You have to smell it to understand my love for it! 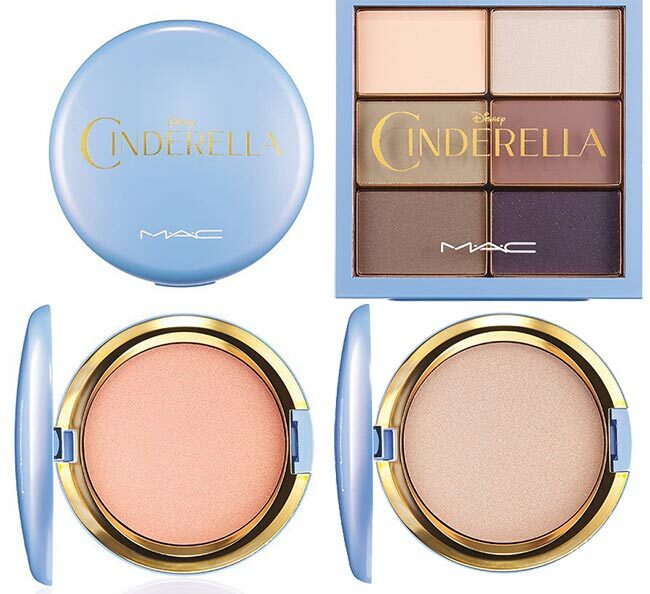 I may be late to the party, but I was pleasantly surprised to hear MAC is releasing a Cinderella Collection! It is available starting February 26th on their website. I feel the packaging is a little bit plain, but I suppose it fits well with the product colors. 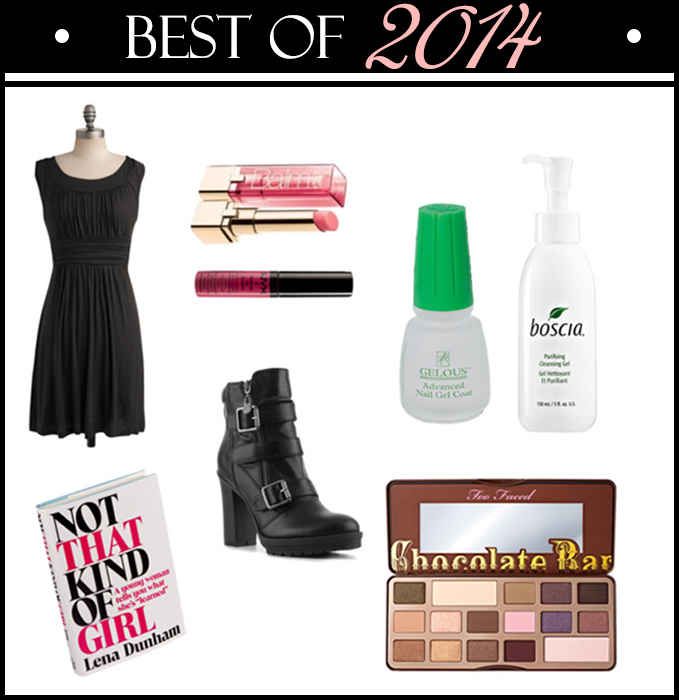 I love the feminine earth tones and am specifically looking at purchasing the beauty powder and maybe a lipstick! Typical gel manicures last a few weeks but, I don’t get them often anymore because no matter how I remove the gel, my nails get weak and brittle. Someone recommended Gelous because it is similar to gel but, removes like a regular polish. Since I bought it I have used it religiously every time I paint my nails. It does help extend the life of some polishes. 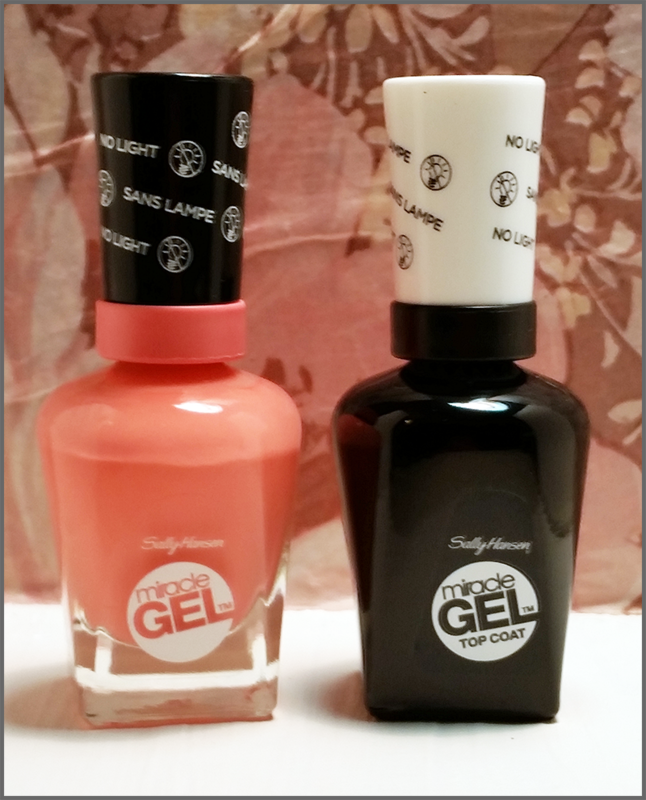 I saw Sally Hansen’s new Miracle Gel product on sale at the drug store so, I decided to try to out. 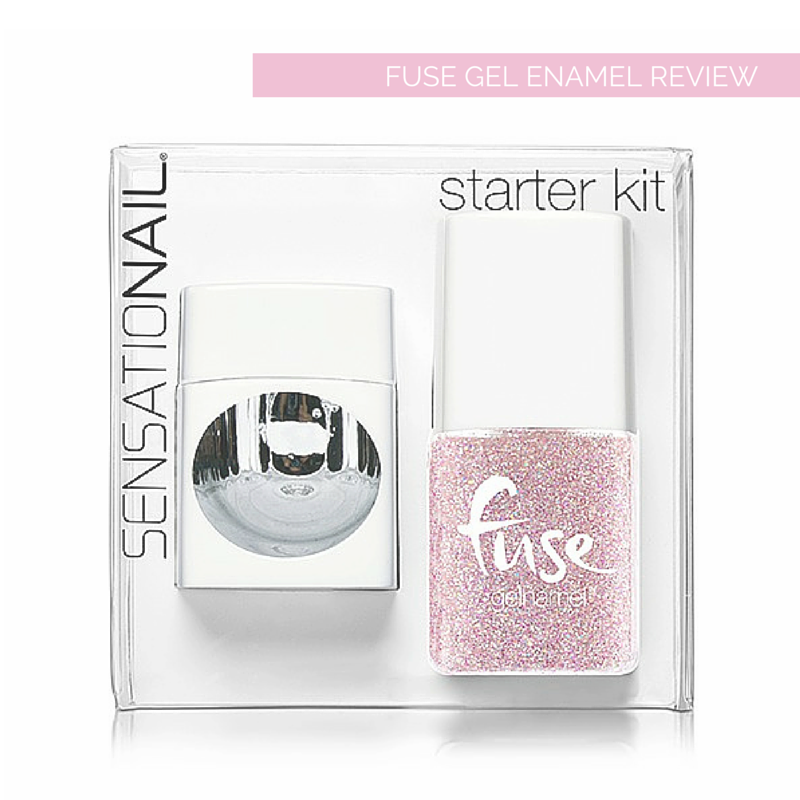 It claims that it is like gel polish that removes like regular polish and no light is required. This is a two step process. 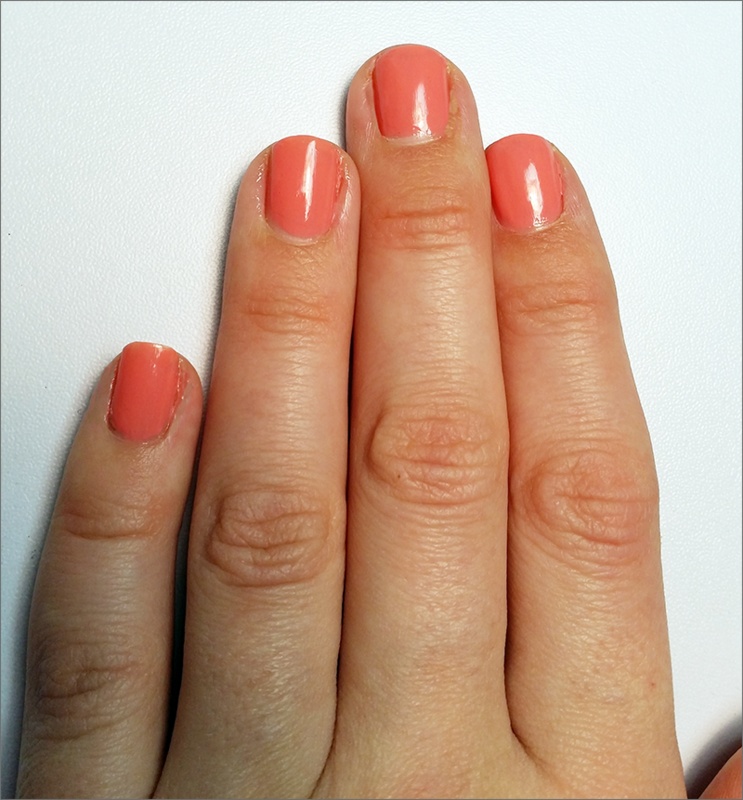 First, you apply the color and then the top coat. I chose the color Rosey Riviter which is an orange coral color. The product directions indicate that you apply 2 coats of the color. For me 2 coats were not enough so I ended up doing 3. I’m not sure if it is the color I chose but even after 3 coats I didn’t think it was enough. This is a photo of what my nails looked like after painting them. 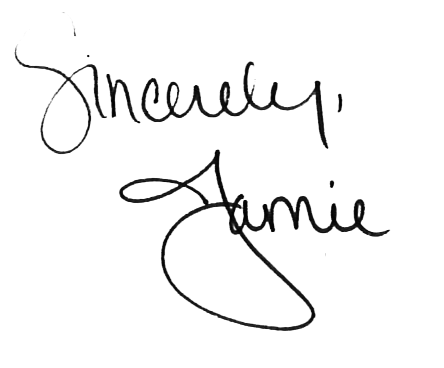 Please ignore my poorly manicured cuticles. Here is a photo of 3 days after application. As you can see there is minimal chipping, but enough for me to want to take the polish off. When my nail polish begins to chip I have a bad habit of picking it off. Considering the fact that you must buy two bottles of polish for about $10 each, I wouldn’t recommend this product. I was very disappointed with how sheer the color was. If it is on sale again I may try another color but, I rather spend the money on two bottles of Gelous. I picked up this little kit at CVS for $10 versus the $29.99 price tag on Fuse’s website. 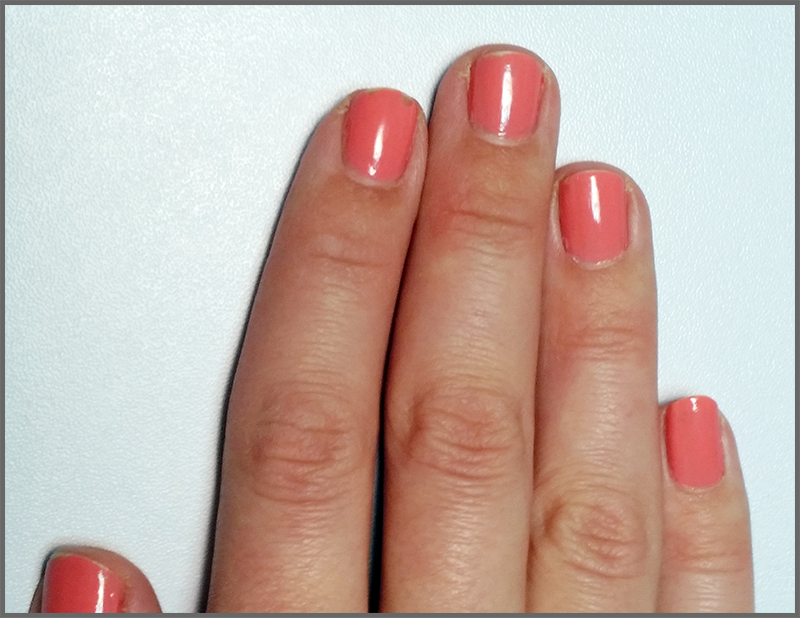 Gel manicures are great because they last what seems like forever, but (yes, there is always a but) when it comes time to remove the gel it is a long process. Usually I soak some cotton balls in acetone nail polish remove and wrap some aluminum foil around each finger tip. I sit there for about 10 or 15 minutes and by then most of the gel has dissolved off. No matter how careful you are during the removal process, your nails will still be somewhat brittle after a gel manicure. For this reason I use Gelous with my polish which isn’t damaging to nails and lasts fairly long. Starting with clean nails use the pink “fuse” file to buff your nails. Take one of the white pads and squirt some of the “fuse cleanser” on it. Rub one finger with it. 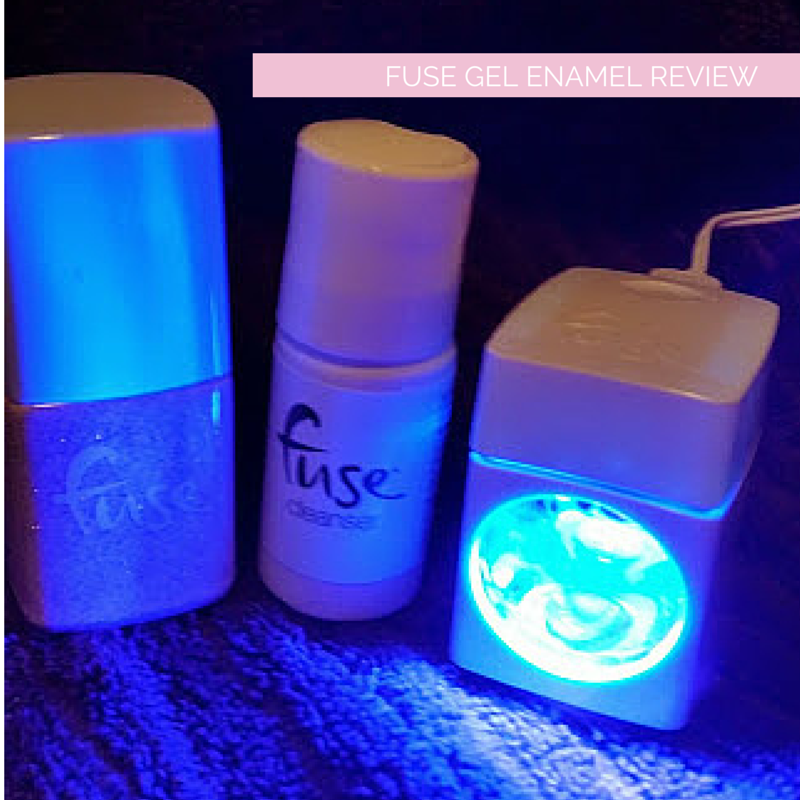 Put a very thing coat of the “fuse” polish onto your nail and then stick it into the LED light for 30 seconds. The light inside will automatically turn off after 30 seconds. Use the pad with the “fuse cleanser” on it to wipe the nail. Repeat process on every single nail. This is what the LED light looks like when lit up. It’s actually pretty clever. This is my final result. As you can see I did not take my time during the process because it grew very tedious after the first few times. I was incredibly disappointed with the color as well. I was assuming it was going to be similar to the bottle and not just sparkles. Although it claims to last as long as a salon gel manicure (which for me is roughly two weeks) it lasted a mere two days! I admit it could rely heavily on user error, but I still wouldn’t spend $30 on this product. The Gelous polish works wonderful and does not damage the nail. The Fuse polish did pull off some of the top layer of my nail when it chipped off. I forgot to mention that it also has an extension that you can fit your toe nails into the LED light. Once it starts to become flip flop weather I will try that feature out.